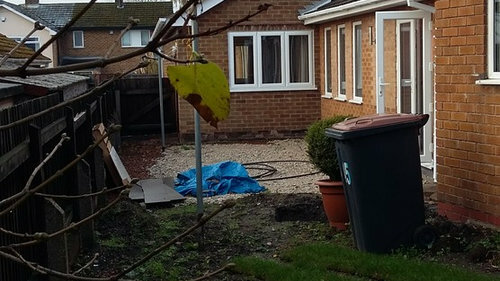 Struggling to design back garden area. This is an area that runs across the back of the house, and also the back of the garage. The front is block paved and leads sdown to the end of the garage. 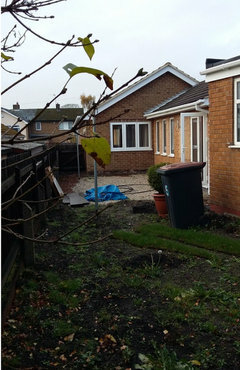 I then have the start of the base (aggregate) ready for paving and the soil area steps up higher towards back of garage. Have lots of grass at front so no requirement for a lot more grass. 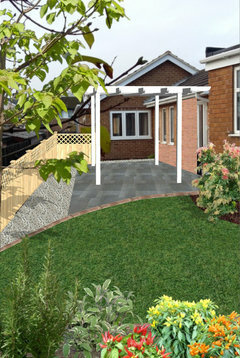 White aggregate border around edge next to fence (1m wide) as otherwise terrace area too big and too expensive! 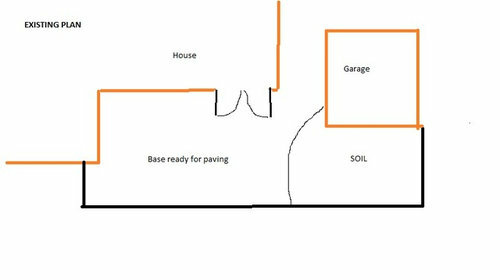 Then possible Wooden edging to the raised soil area at back of garage and grass/turf this. 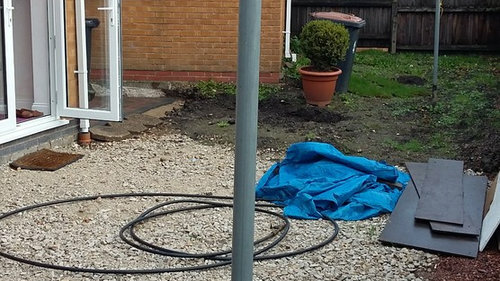 Maybe leave small soil area as small plot for planting vegetables behind garage?! REALLY apprecaite help! You've got a lot of brick colors and sizes and patterns going on. It's tricky complimenting existing brick with concrete pavers, but can be done. 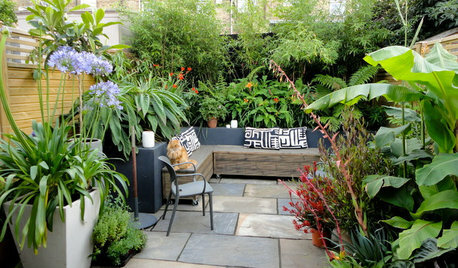 I had a similar patio at my last place, went with gray pavers and it was OK, but if I could do it again, I would have installed a low wood deck (one that didn't need a railing) or done poured cement or large cement blocks with bricks lining them. Less busy. Also, I recommend planting some pretty shrubs against the fence, gives you something to look at and enjoy when you are out on the deck. There are inexpensive options that will stay small and narrow. Not sure your zone but it looks like it is temperate, so I can tell you that I had good luck with globe arborvitae, Ms. Kim lilac and magic carpet spirea under similar circumstances. I also had some junipers but they were not as easily available and I did have to prune them some. I also had a blueberry bush, dwarf Japanese maple, climbing knockout rose and dwarf clethra that also did well in the confined space. I had a hedge of raspberries on trellises against the garage ad they were a huge pain, but I could never bring myself to tear them out when they bloomed and set fruit. Ninebark is also an easy peasy and inexpensive shrub to get but it has to be hard pruned every year to keep it confined. A similar substitute is wine and roses weigela which I see now has been bred to dwarf size. I also had some dwarf conifers, but they are more expensive, harder to find and harder to take care of. But sky pencil holly, sky rocket juniper and Alberta spruce are plant suggestions that you can get all the time in most places and could work. Also some of the dwarf azaleas if they grow in your zone. 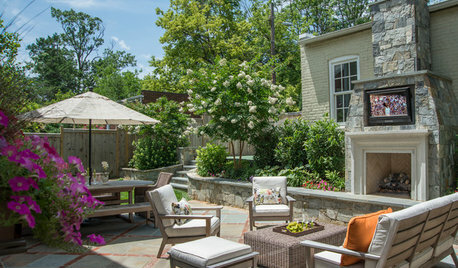 I wouldn't use aggregate across the back of the patio unless you are planning to put a BBQ or something similar there. 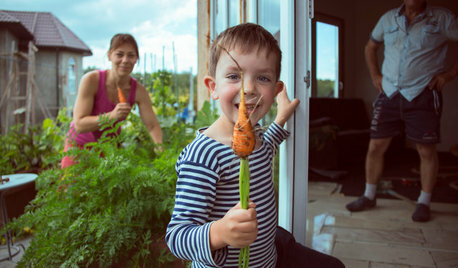 I would plant it with groundcover if you aren't interested in gardening there, or perennials or veggies if it's got enough sun and you are interested in active gardening. 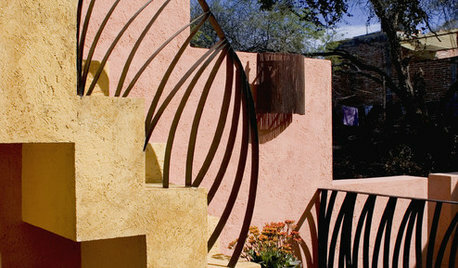 Or add some vines to grow up the pergola. Gravel is a real pain to keep weeded unless you are in a really dry area, and it won't add anything positive to the yard. Instead, mulch well with bark mulch until whatever you plant fills in since it's easier to weed and will over time improve the soil as it breaks down. 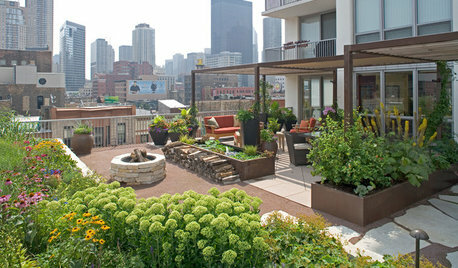 I also wonder what your goal is with planting such a small grass area along with a tiny veggie space. I wouldn't want to have to mow such a small area. 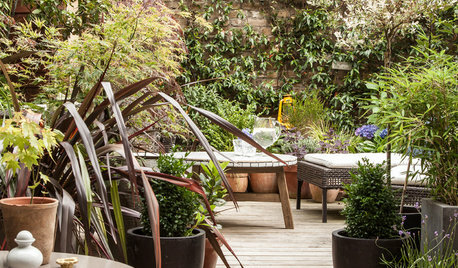 Look at images of potagers or extend the patio area or plant groundcover. Do you need to plan for a storage spot for the trash can? A couple of final notes. 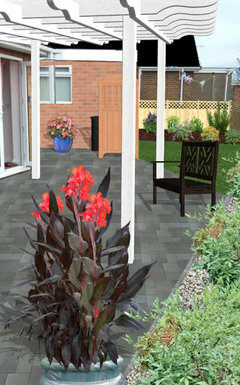 Be sure that the pitch of the patio will drain water away from the house. If you want suggestions on plantings, adding your location and planting zone will help. Here's how to add it to your profile so that it will post next to your name in the gardening forums: Go to Your Houzz in the upper right of every page, click Edit Profile, and on the left side click advanced settings. Well down the advanced settings page is a blank labeled Climate Zone for Garden Forums along with a link to find your zone. If you add info on your state or the nearest large city either here or on the profile page under the name posted, you will get even better information since zone only relates to average coldest winter temperatures. Then return to the top of the page and click Done Editing. NHB when I had a small yard I "mowed" it with a weed whacker in about 15 min. I kept the grass because it was easy and I liked the feel of it on my bare feet! A little area like that close to the house could also be done with a small push or electric mower. 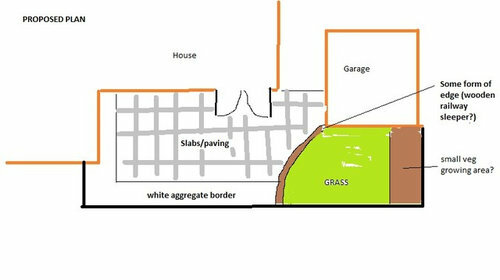 Given that you are working with a relatively small area, you might consider establishing a concave curve instead of convex for the area you show as grass on your plan. It would allow for easier walking space. I don't see the appeal of a border of white gravel. Why? 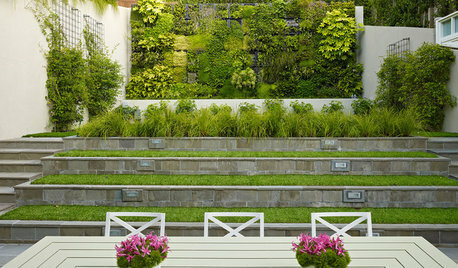 Why not just landscape space with plants and mulch? It would be more attractive and not as difficult to maintain, as trying to keep white gravel clean would be. It's difficult to make curves with wood. A "mowing strip" of brick or pavers could be much more successful in doing that. Please put plants, not aggregate, by the fence! You don’t want it to look like a nicely done prison yard! 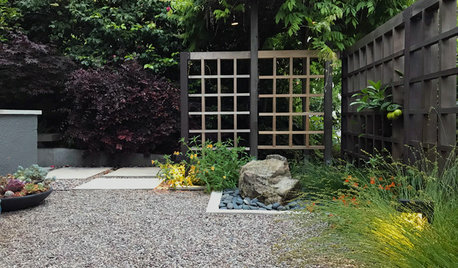 Yeah, but if you don't want the trouble of plants, then groundcover or even colored mulch (for this application) would be easier to maintain than rocks. Unless you are a rock hound! Just having lived with a fence that close to my deck, I can tell you from experience you want something to break up that closed-in feeling. You could also hang some decorative art on the fence, even fake windows or mirrors, I have seen a couple of places like that, so if you don't want plants, that's an option too. 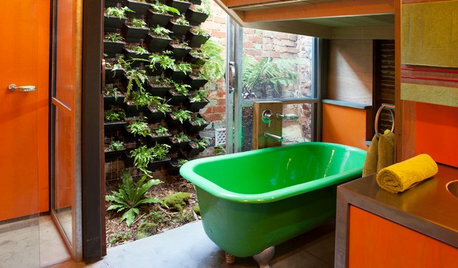 But even a few pleasant looking plants would be nice to break up the monotony of that long blank wall. As a group of rock hounds, we'd have to advocate for natural stone! :) We love large Mexican beach pebble as edging, easier to accommodate curves than a railway sleeper would be. Best of luck with your project! We look forward to seeing how it turns out. 10% grade front yard, cost to grade/terrace? Small shrub to replace under-performing roses, suggestions? Curb appeal help needed for my overly busy 1950's bungalow. Yew hedge planted too tight...leave it or fix it?